In 1925, in the midst of working on the Red Book (RB) Jung wrote “It seemed to me I was living in an insane asylum of my own making. I went about with all these fantastic creatures: centaurs, nymphs, satyrs, gods and goddesses as though they were patients and I was analyzing them”. S. Shamdasani, the editor of the RB, noted that Jung found mythological work both exciting and intoxicating. Jung understood mythological images as symbols of the universal life force (libido) depicting the movements and dynamics of the autonomous, archetypal psyche. 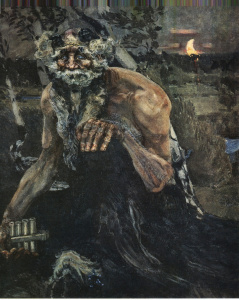 Jung writes about one of his earlier visions: “On the night when I considered the essence of the God, I became aware of an image.” In this vision he dialogues with Elijah and his daughter Salome. Two thoughts strike me immediately as relevant for an understanding of Jung’s approach. One is his use of the word image. A necessary duality has been created. Necessary because all creation depends on this duality and the forever shifting dance between the two opposing forces. A oneness has been torn asunder. It is in the liminal space in-between that new life can be born. In the context of self-reflection the new life can be a new insight, the possibility of a new pattern of experience. In the context of a necessary duality, it is interesting that Jung when contemplating the essence of “the God”, encountered a male AND a female figure. The transpersonal may be a field of oneness, but the human intellect can only approximate the divine mystery of creation as two intertwined forces. As above so below. Think DNA. These two opposing forces are often referred to as masculine and feminine, but one must drop all preconceived notions about gender or sexuality. 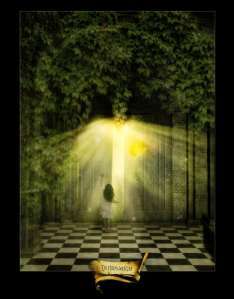 Each individual psyche, male or female, is made up of these energy strands, as is the objective, archetypal psyche. Yang and Yin are more neutral descriptions. Jung elicited the principles of Logos (yang, masculine, foresight, legislation, ordering, willful) and Eros (yin, feminine, receptive, related, moving, dissolving) out of his visionary meeting with Elijah and Salome. Jung writes: The way of life writhes like a serpent from right to left, from thinking to pleasure and from pleasure to thinking.Collectively and individually we are suffering an imbalance in this eternal dance that has favored the masculine principle. Where Logos rules order and persistence prevail, where Logos rules at the expense of Eros, it degenerates into dominance and abuse of power. In the individual this tendency can be associated to the sickness of the soul, known as the narcissistic personality. The problem of narcissism has been thought of as a characteristic of a dying culture. I can see this trajectory, unless psyche is irrigated by the flow of eros and balance is restored one more time again. I am less interested in why Jung’s psyche chose Elijah and Salome as personifications of his unconscious thoughts. These are uniquely his images. It seems of much greater significance how he engaged these images. A method that later became known as Active Imagination. A technique that strongly emphasizes the duality principle. In other words, the ego, the “I” as I know it does not disappear in the face of the visionary figure. One must hold ones ground vis-a-vis an imaginative figure. They are to be met with respect, but not revered as gods, because they are not. Nor are imaginative figures spirits who have all the answers and will tell one what to do. They also don’t foretell the future. Our psychic images are real, but the essence of their reality is behind the surface of the mental image.